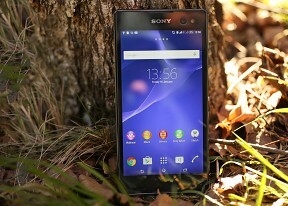 The Sony Xperia C3 comes with Android 4.4.2 KitKat out of the box. The launcher looks identical to what you would see on any other KitKat Xperia smartphone, like the Xperia E3 we recently reviewed. If you aren't familiar with it, you can check out this quick video below to get you up to speed. The lockscreen is the usual affair - it supports widgets (one per pane), while the rightmost pane will fire up the camera. There are a few available default widgets, but you can always get more from the Play Store. Also third party apps oftentimes come with their own set of extra widgets. Naturally, you can protect your lockscreen by Face, Pattern, PIN or Password unlock, in ascending order of security. There are five homescreen panels by default and you can set any of them as your primary one. You can't have more than seven panes at any given time though, nor can you change the order they're in. You can set various live and static wallpapers, add widgets and shortcut, or change the UI theme. You can also choose which icons will be visible on the status bar, and which should remain hidden. The notification area lists notifications in the default tab with a separate tab for Quick Settings. You can gain quick access to the Quick Settings tab with a two-finger swipe from the top. The toggles are customizable and you can choose between 20+ different toggles and have up to 12 of them visible in their dedicated page. Holding a finger over any toggle will give you direct access to its menu listing. If you enable the one-hand operation gestures from the Settings menu, you can tap twice on the Home key and the Notification area will automatically drop down, with its entire interface closer to your fingertips. Apple iPhone 6 and 6 Plus does pretty much the same thing with their Reachability feature, though it works across their entire UIs. The app drawer is laid out across multiple pages and you can sort the apps manually, alphabetically, by the most used or most recently installed. The menu with those settings is accessible via a swipe from the left edge of the screen and you can also search and even uninstall apps from there. The Xperia C3 uses the stock Android task manager that lets you switch between recently opened apps, as well as terminate them with a side-swipe. The so-called "small apps" are also available in the Xperia C3 and are accessible via the task manager. They are similar to Samsung's Mini Apps, and pop up tiny widget-like applications on your homescreen, which you can move around and use without having to open the full-fledged app. So far, there's a default set of nine: Active Clip, Chrome Bookmarks, Browser, Calculator, Calendar, Gmail, Timer, Notes, and Recorder. You can launch only one instance of a Small App, but you can open multiple Small Apps simultaneously. You can download more Small Apps off the Play Store or use the option to turn your favorite widgets into Small Apps. Just hit the Plus key at the top of the list and choose a widget. Sadly, you can't disable the small apps entirely and will always have them cramming your recent apps whether you use them or not. Finally, Google Now integrates with your Google account and can access your daily routine, internet searches, email, etc. and give you information relevant to your interests and daily needs. The built-in 8GB of storage gets filled up pretty quickly and the Xperia C3 needed a microSD card to help carry the load. And while we quickly obliged and moved the images, videos and other multimedia files over to the card, apps were harder to move. You can transfer most of the built-in and all of the downloaded apps into the external memory but that would take you precious time and digging through the menus.